There are certain holidays that make me miss Massachusetts ridiculous amounts. I grew up in the Birthplace of American Liberty (that's not conjecture - it says so on our flagpole), and so holidays related to American history remind me of my historic hometown. This is pretty normal to see on any given day in Lexington. The first, and perhaps most obvious to my friends in the Greater Boston area, is Patriots' Day in April. 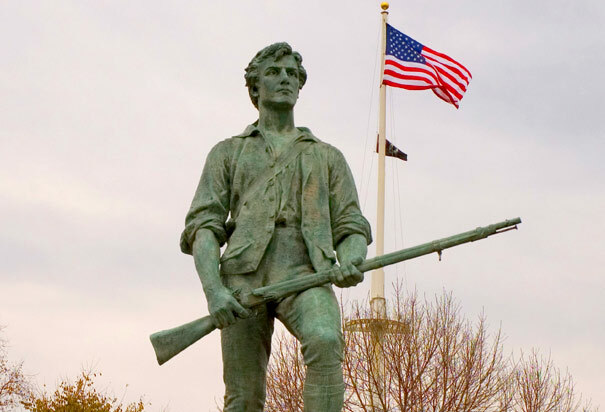 It commemorates the Battles of Lexington and Concord and the famed midnight ride of Paul Revere. 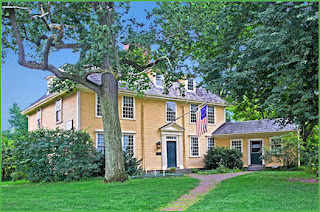 Each year, Lexingtonians rise early to watch Paul Revere and William Dawes warning John Hancock and Samuel Adams at the Hancock-Clarke House (one block down from my childhood home!) that the British Regulars were marching toward Lexington. The 5:00 AM battle reenactment is also popular, as the Redcoats march in from Boston and start firing on the Minutemen, officially starting the Revolutionary War. I haven't attended since I was about four, since the gunfire is loud and terrified me at the time. (That one time that I did see the reenactment, there were some disturbances on the battlefield as elementary school students, fearing for the lives of the Minutemen, ran out onto the Battle Green to see if they could help them and tried to call 911.) After the morning reenactment, there are pancake breakfasts at the churches around the Green as well as morning and afternoon parades. Buckman Tavern: Conveniently located off of the Battle Green, it is where the Minutemen went to drink between the time they were alerted that the British were coming and the time that the British actually showed up. 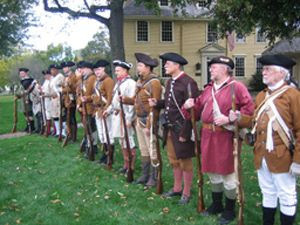 Patriots' Day is the Monday on or around April 19, and was always the first Monday of the public schools' spring break. To the rest of the country, it is often better known as Marathon Monday, when really fast people run around Boston. I had no idea how much I'd miss Patriots' Day until I moved to Michigan, where no one had heard of it and it fell right around finals time. The rumor is that he was modeled after a wrestler from Waltham. The Fourth of July is another holiday that makes me miss Lexington and Boston. While I rarely did anything special for the Fourth, it always felt like a very Bostonian holiday to me. On the Fourth, the Boston Pops performs their Boston Pops Fireworks Spectacular on the Esplanade. I usually watched it on TV with my family, though a couple years ago I went to the pre-concert on July 3 with some friends and got to see Neil Diamond sing "Sweet Caroline." On the third or fifth each year, Lexington lights off fireworks from the high school football field, and the Lion's Club sets up a carnival. I am not an especially patriotic person, but there's something about American holidays that get to me. Maybe part of it comes from my interest in historical memory - as both a history student and a Lexingtonian it frustrates me when politicians mess up American history. (I would add a link there but it seems unnecessary. Also, there are sadly multiple things I could link to.) But also, it comes from my personal regional identity. I spent four years in Michigan and loved it, but I will always be an east coaster and specifically, a Massachusetts girl. I'm spending the Fourth this year in the place where it really happened - I might even go hang out by Independence Hall where they signed the Declaration of Independence! - but I still miss Boston. While there will be plenty of chances to hear renditions of the "Star Spangled Banner" or "America the Beautiful," I will more likely be humming "Dirty Water" to myself as I wander around Independence Mall, eating hot dogs and pointing out that John Adams was from Massachusetts. Happy Independence Day to all! What are your plans this Fourth of July? Do you have any favorite American holidays?